Optimize, Speed Up & Fix Errors ! • BHO manager lets you remove unused internet explorer plug-ins, to ensure a faster internet experience. • Optimize your system with one click to speed up your PC. System Optimizer Do you have troubles with speed up your computer? Optimize System offers you three classical and effective methods to perfect your computer with only a few of clicks. Internet Tuner, Memory Tweak and System Optimizer lets you select the optimization model of your computer. System Fixer It is a Professional scanning and fixing Toolkit to diagnose your operating system. Together with the Easy Repair Wizard, Error Utilities, File Association, Register ActiveX, Shortcuts Fixer, Winsock2 Repair toolkits and more, System Fix helps ensure a comprehensive repair on your need. Error Utilities - List known problems and other problems found on your PC system to repair. Internet Explorer 6.x failed to reinstall, Internet Explorer opens off screen, tiny or minimized, Error 2013, Error 0x0000000A, Event 11, Error Code 19, Error Code 37, Error Code 31, Error Code 39, Error 1607..etc. Winsock2 Fix - acts like an interface which connects the applications to your operating system. This professional-fixing utility will automatically find these dll files and all you need to do is to click "Repair" button to repair winsock2. Restore ActiveX - re-registers ActiveX and .dll objects' registry keys to solve the curious problems on your system such as: unable to open new IE windows, website displaying incomplete, unable to auto update Windows, unable to select films model to watch picture, random error with Media player, and so on. Shell Repair - Display detailed information of the system file association. Fix the invalid file association in order to make sure that the system application can open the associated files correctly. System Tools This Toolkit includes 4 useful and effective utilities on enhancing the usability and performance of your PC. Block ActiveX utility can be used to manage ActiveX controls installed on your PC system by blocking malicious controls. Startup management helps you customize your startup list and eliminate startup clutter. It reduces the time it takes for your computer to start by removing unnecesary programs that use up valuable system resources. This is the biggest speed boost you can give to your computer without upgrading any harware. Add or remove programs manager lets you remove unused software that was previously installed and remove unnecessary clutter from your computer. This feature allows you to remove applications that were uninstalled incorrectly or weren't completely removed by the Add/Remove Programs utility. File Splitter & Joiner: Enables you split your large files (like Zip archives, multimedia, songs, videos, movies, backup, archive document files...) into a series of smaller files which shaped of pieces and later combines the pieces to mold the original even without RegistryWise Cleaner. Backup Compatibility RegistryWise Cleaner provides you Folders Backup, Restore Point and Favorites Backup. You can save the any data, favorites and folder private information for later use with RegistryWiseCleaner. Internet Explorer Tools IE Tools Toolkit comprises a host of rich built-in utilities to guarantee a better and healthier environment of your IE browser. BHO manager lets you remove unused internet explorer plug-ins, to ensure a faster internet experience. A Browser Helper Object or BHO is a helper program that is associated with the Internet Explorer browser. Every time you open Internet Explorer all BHOs installed on your PC will be loaded and run along with the browser. Even if you don't use Internet Explorer, BHOs may be loaded each time you open a new folder in Windows Explorer. Internet Explorer backup/restore. Keeps a backup copy of all your internet explorer settings.You can easily repair Internet Explroer if any program or spyware software changes any of its settings. Registry Cleaner Repair invalid registry files to keep your PC away from blue screen,system crashing and computer freezing. Who Uses RWC for PC Optimizing? I remove them the right they where leaving files on my hard drive. I even spent two hours one time trying to get rid of these files but i couldn't, then i used this program that found and took out these file in less then two minuts. 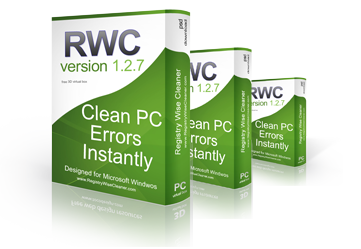 I highly recomend this RWC cleaner. I'm running this app from time to time to clean up stuff from my registry files. It works great for me and I'm not a pc expert of any kind. What I need is a button to click and let the app do the rest. My best investments! I use this program a few months and pleased with results. I highly recommend to all Internet surfers. Simple and effective! Thanks. Not only is my computer running faster, but I'm able to surf the Web faster too. I never realized that there were so many problems with my PC until I ran your software.